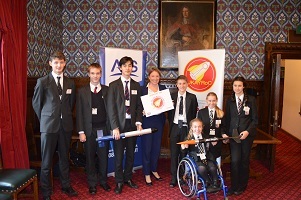 This week ADS was in Parliament with two of this year’s finalists of the UK Youth Rocketry Challenge (UKRoC) to showcase the challenge to MPs and help launch the 2019 competition. Throughout the day nearly 25 MPs came to hear from the teams from Tonbridge and Abbeyfield schools about their experiences of the challenge and what they learnt from creating their own rockets. ADS are the proud organisers of UKRoC and have been running the event annually since 2006. The challenge is aimed at students aged 11 – 18 from any secondary schools, colleges, educational facilities or youth groups to design, build and launch a model rocket with a fragile payload all whilst learning more about STEM subjects. MPs from across the country were enthusiastic about how the challenges spark young people’s interest in STEM subject and hope that it leads to more young people taking careers in sectors such as aerospace, defence, security and space. UKRoC is a great way to engage the next generation of engineers with practical experience of building and executing complex missions. This is an exciting way to learn more about maths and science, with the UK winners getting the chance to compete against teams from France, USA and Japan at the International Finals which in 2019 will be hosted at the Paris Air Show. Registrations for the 2019 competition are now open with regional finals beginning to take place from April 2019. You can find out more about the challenge and read about the 2019 rules on the UKRoC website here. See below a selection of Tweets from MPs supporting the challenge in Parliament.